TAMPA, Fla. — The new Bertram Yachts is ramping up boat manufacturing and service operations at its new plant in Tampa. 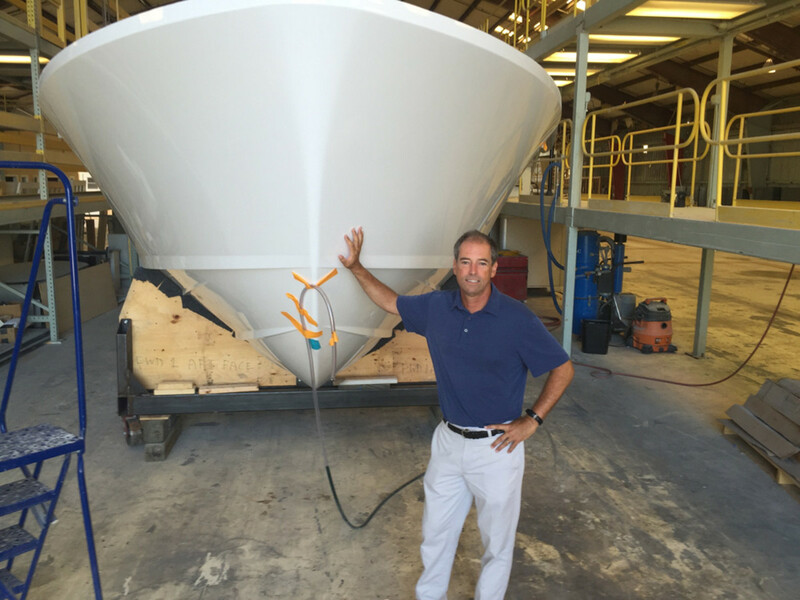 Bertram Yachts CEO Peter Truslow is shown with hull No. 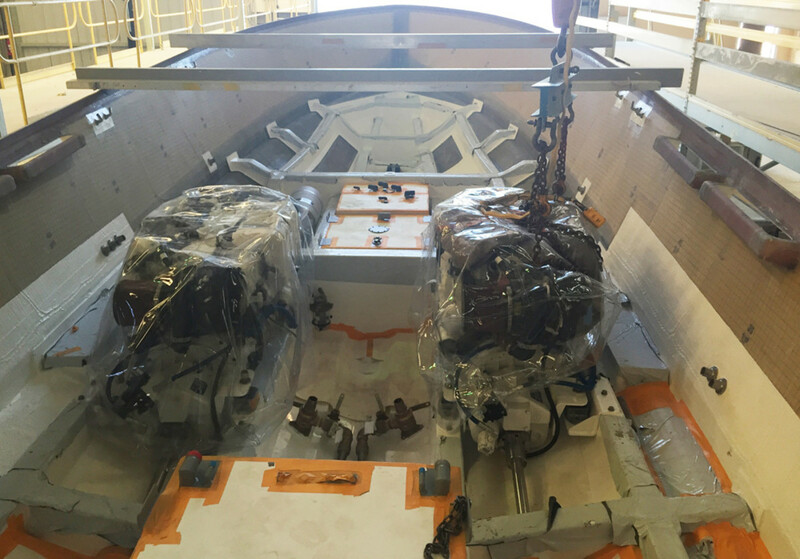 3 of the Bertram 35, which is being assembled and completed at the new Tampa facility. TAMPA, Fla. — Only six weeks after the purchase, the new Bertram Yachts is ramping up boat manufacturing and service operations at its new plant in Tampa, drawing from the area’s experienced marine-industry workforce. “We want to get the message out that we are not only a boatbuilding facility, but also a maintenance and service yard for yachts,” Bertram Yachts CEO Peter Truslow told Trade Only Today during a visit Thursday to the 120,000-square-foot waterfront shipyard. Bertram Yachts closed on the property — the former Lazzara yacht-building facility, just south of the Gandy Bridge on Tampa Bay — in late June. The Italian industrial corporation Gavio Group acquired Bertram’s assets in 2015. The company’s first boat, the Bertram 35, will be on display at the fall boat shows, including Newport, Annapolis and Fort Lauderdale, said Truslow. It also will make a few stops along the way, such as the Bertram enthusiast-owned Flying Bridge Restaurant in Falmouth, Mass., said Truslow. Truslow gave this writer an hour-long tour of the plant. It includes the 50,000-square-foot Bertram production building, which is where hull No. 3 was being assembled. Bertram retained Lyman-Morse Boatbuilding in Thomaston, Maine, to build the first two Bertram 35s. Michael Peters Yacht Design in Sarasota, Fla., designed the 35 and the Bertram 60. The first 60 should be completed by the end of 2017, said Truslow. Hulls two and three of the 35 will be completed this fall, and in six months Bertram should be building one boat a month, he said. Truslow and vice president of production Earl Blackwell are excited about the standout workforce and quality marine vendors in the area. 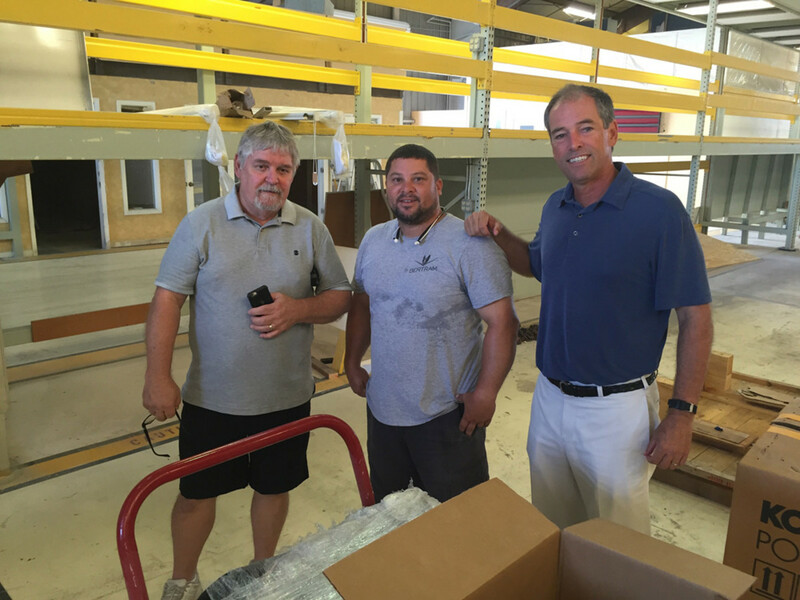 Truslow (right) is shown with materials manager Wayne DeLoach (left) and mechanical leader Alex Cadiz. Bertram employs 25 people in Tampa and expects to hire 25 more by year’s end, said Truslow. The area offers a diverse group of marine vendors, he said. Bertram is working with companies such as Pompanette and Admiral Marine in Tampa and Sarasota’s Marine Concepts, Bluewater Yachting Solutions and GG Schmitt & Sons. A pair of 500-hp 7.1-liter Caterpillar diesels will power hull No. 3. Truslow, the former EdgeWater Boats president who joined Bertram this spring, has been impressed with the progress the Bertram team, which includes CFO Francesco Reisoli, has made.